Let o(n) be the number theoretic function which denotes the sum of all divisors of a natural number n. If o(n) is an integral multiply of n, then n is denoted as a multiply perfect number or k-fold perfect number (also called multiperfect number or pluperfect number). Call o(n)/n abundancy (also called index or multiplicity) of n. A multiply perfect number is called proper if its abundancy is > 2. For example consider the divisors of the number 120: 1+2+3+4+5+6+8+10+12+15+20+24+30+40+60+120=o(120)=o(2^3*3*5)=o(2^3)*o(3)*o(5)=(1+2+4+8)*(1+3)*(1+5)=15*4*6=360=3*120. Hence 120 is a 3-fold perfect number. In column "Which was last?" the identifier ln(ln(MPN)) is given for those which were verfied by me. I checked these numbers only for those MPNs reported before 2017-05-23. We have a total of 5311+3 (of which 5263 have an abundancy > 2) known and claimed MPNs until 2018-01-07. It is extremly probable, that all proper MPNs with abundancy <= 7 are discovered. Richard Schroeppel's archive of 2094 MPNs built 1995-12-13 . | is a separator character between the fields and is not allowed inside any field. Except of the last field, comment, all other fields are obligatory, but they can be empty, e.g. if the discovery date or person is unknown. M indicates the abundancy of the number as a lower case letter, such that the letters a,b,c,d,... correspond to the abundancies 1,2,3,4, ... .
ln_ln gives the decimal value of logeloge of the number and is rounded to 7 decimal places after the period. This serves now as a unique identifier to each number, also. rich_id is Rich's unique identifier for this number which encodes the abundancy appended by the exponents of at most the three primes 2,3,5. These exponents are encoded alternatingly in a 26-base system made up of the letters a-z und a 10-base system made up of the digits 0-9. The letter @ is used if a prime exponent is zero. In the case that this identifier is still ambigious, it is appended by a lower case letter which serves as a counter. R. Sorli likes to avoid this further counter and recommends to use not only the primes 2,3,5, but as less as further necessary for unequivocality using Rich's scheme of alternatingly letters and digits for encoding the corresponding exponents (at most up to and including 23 is sufficient until now). deep indicates the minimal number of successive primes (starting with 2) whose exponents must be given to reconstruct the MPN straight forward (without knowing its abundancy). dpf indicates the number of different prime factors. tpf indicates the number of total prime factors. date gives the year of the first (or independent) discovery in the form YYYY-MM-DD as long as month and day (and year) is known. name gives the name of the discoverer. Like in the date field, multiple independent discoveries are separated by commas. number is given in its prime factorization of the form:base1^expo1.base2^expo2.base3^expo3. .... where the basei indicates a prime of an ascending list of primes and the expoi indicates the corresponding nonzero exponent; an exponent value of 1 is omitted together with its leading ^. In the case of the larger 2-perfect numbers, the odd prime (2^? ?-1) in the factorization is given as M?? to save space with ?? giving the Mersenne Prime exponent as decimal number. $ -- end of record. Hint: orient on the field separator | or the comma in each record to get easier what you want. And a further list of multiply perfect numbers sorted only by their factorizations (built from the 5311 MPNs of the master list and gziped 200 kB). It has each line cut down to 120 columns and no discovery information or comments are given. Rich's out-dated indentifier is omitted, but a log10(MPN) is given for traditional reasons. Finally, here are the (email-extracted and edited) 2 claimed new (since the database update) found MPNs which I irregularly append (last change: 2017-05-23). To verify these numbers, three steps must be taken: 1) verify for each number n given in its prime factorization that all factors are really prime numbers, 2) compute o(n) which envolves the factorization of large numbers and then check n's claimed abundancy 3) and lastly test whether n is really new. They are as more important, as fewer primes are involved in such a substitution. As larger the smallest prime in such a pair is, as more usefull it is, too. On the other hand, as smaller the quotient of the number of different primes in n to the size of the substitution becomes, as more worthless such a substitution becomes for this n.
The sign < in the row period means "up to and including" the given year. The value in the row increament indicates the new known MPNs compared to the previous time-period. The column 'count' counts the discoveries until 2013-12-31 and an asterik * indicates that this person has "only" discovered 2-perfect number(s). Italic printed values perhaps change in the future. The identifiers for each MPN are given in parenthesis. (*) The word factors means prime-factors. The only odd multiply perfect number is 1. Consequently each (2-fold) perfect number is even (claimed already in the Middle Ages). There are infinitely many perfect, i.e. 2-fold multiply perfect, numbers. For each fixed abundancy > 2, there are only finitely many multiply perfect numbers. For each fixed prime power, there is at least one MPN which has exactly this prime power in its prime factorization (lowest two-power-exponents for to-discover MPNs are 331, 335, 336, ...). If the number of MPNs up to a given limit x is proportional to ln(x), then the density of the MPNs should be proportional to 1/x. And a further picture to visualize the density of the known MPNs. In first approximation it may be a Poisson-distribution. You guess that surely there are missing MPNs at last at the currently known 4000th MPN, but also highly probable earlier. Finally a best linear fit for the smallest 3600 known MPNs except the first 100 MPNs to avoid 'start-effects' was done on a logarithmic scale. For these 3500 numbers this least-quadratic error approximation results a correlation coefficient of 0.99815 with # MPN ~ 2.2328ln(x)-48.3655. Richard Schroeppel stated that he constructed all MPNs < 1070 in the eighties of the twenty-century (but probably only 1990), i.e. he proved that there exist exactly 258 MPNs smaller than 1070 -- and besides showed that there are no odd MPNs < 1090 except 1. In March 2008 Achim Flammenkamp finally constructed all MPNs < e350 by an exhaustive tree-search, i.e. proved that there are no further but the 730 known MPNs. Here is a small paper presenting the theoretical and practical background to this computation. Let us introduce Fred Helenius' notion of the effective exponent. The prime p=2 is special compared to other primes, because p-1 has only the trivial divisor 1. A consequence of this fact is, only if p equals 2, then numbers of the form pn-1 could be prime. Assume a fixed MPN m has in its prime factorization the two-power exponent k. This means that o(m) has a factor 2k+1-1. Depending on k this factor may have some prime divisors of the form 2n-1. Because we are considering a MPN, o(2n-1) = 2n must be also a factor of this MPN itself, if 2n-1 occurs exactly onetime! Hence the original prime-power 2k may produce immediately further two-powers. Or put it in other words: only the `remainder' of this exponent k must be produced by other prime-powers. So, the exponent is effectively reduced in consideration to the to-be-generated two-power factors by other prime-powers. Primes of the form 2n-1 are called Mersenne Primes and are known up to high values of n. Thus we have to check which Mersenne Prime 2n-1 divide a given 2k+1-1 exactly onetimes. Subtracting k+1 by such Mersenne Prime exponents n gives the effective exponent of k. There is a small blemish in this model: small primes of the form q=2n-1 may as well be produced by other prime-powers (than two-powers) of a MPN, such that the exponent of q is not 1 in the factorization of the MPN, but larger. Hence we have probably overestimated the correction of the two-power exponent a bit. The two-power exponent k of a (2-fold) perfect number has always an effective exponent of 0. For such an effective exponent of 0, there seems to exist only the corresponding (2-fold) MPN except in the case k equals 2. If k = in-1 with n the exponent of a Mersenne Prime and i a small number, the effective exponent is at most n(i-1), roughly 1-1/i of the given exponent k. Such exponents k are typically the largest two-power exponents for which a MPN for a fixed proper abundancy exists: 61=2*31-1, 92=3*31-1, 177=2*89-1, 253=2*127-1, 320=3*107-1,380=3*127-1. 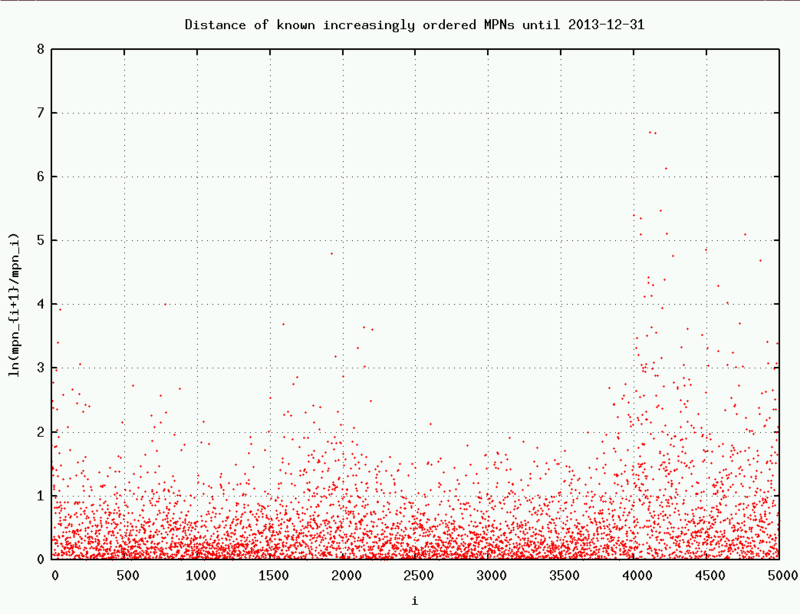 Finally, for a given two-power exponent k the effort to compute a MPN with an even factor of 2k seems more related to its effective exponent than to k --- this is heuristically convincing and seems likely to be the reason this quantity was invented --- and lastly the distribution of the prime-exponents of a `typical' MPN seems proportional to the effective exponent than to the two-power exponent. R. D. Carmichael & T. E. Mason, Notes on Multiply Perfect Numbers, Including a Table of 204 New Ones and the 47 Others Previously Published, Proc. Indiana Academy of Science, 1911 p257-270. Leonard Eugene Dickson, History of the Theory of Numbers, 1919, v.1 p33-38. Paul Poulet, La Chasse Aux Nombres, Fascicule I, Bruxelles, 1929, p9-27. Benito Franqui & Mariano Garcia, Some New Multiply Perfect Numbers, American Math Monthly 1953 p459-462. Alan L. Brown, Multiperfect Numbers, Scripta Mathematica 1954 p103-106. Benito Franqui & Mariano Garcia, 57 New Multiply Perfect Numbers, Scripta Mathematica 1954 p169-171. Alan L. Brown, Multiperfect Numbers - Cousins of the Perfect Numbers - No. 1, Recreational Mathematics Magazine #14, Jan/Feb 1964. Motoji Yoshitake, Abundant Numbers, Sum of Whose Divisors are an Integer Times the Number, Sugaku Seminar, v.18 n.3 p50-55, 1979.
private communications from M. Garcia, Stephen Gretton, M. Yoshitake, Fred Helenius, and Achim Flammenkamp. Ron Sorli's Thesis: Algorithms in the Study of Multiperfect and Odd Perfect Numbers 2003, Sydney, Australia and its first 9 pages . A gziped-tar archive containing the sigma-chain database and its C-sourcecode library (486kB) to access and maintain it ( version 4.1d). Eric Weisstein's explanations of MPNs. .